Robot vacuum cleaner comes in disc-shaped for that powerful automatic cleaning. With next level sensors and easy usability, robot vacuum cleaners can add efficiency to your cleaning chores. You can purchase the cleaning robot somewhere between $150 to $1000. Here I am gonna talk about the advantages of having a robotic vacuum cleaning at your home. As I don’t have time to clean my room manually, that’s why this year I decided to buy a robotic vacuum cleaner. I purchased the Roomba 960 Vacuum Cleaner, and it’s impressive. I highly recommend you to buy a robotic vacuum cleaner from Irobot. They have great technology and cleaning performance awesome. As of now, they have six models available on the market. You may check this post of roomba comparison. Recently iRobot launched Roomba e5, i7, and i7+. Others models are Roomba 675, Roomba 690 and Roomba 960. So, check the comparison chart before you buy to know what is the main differences between these models and which one is perfect for you. The convenience of pushing buttons and getting your home cleaned is the best thing you can ever have in your life. The robotic vacuum cleaner does not require any special supervision or time investment. It is a perfect thing for working individuals who often need to recruit those expensive housekeeping services. With minimal maintenance, you can shoulder all the cleaning responsibilities to the robotic vacuum cleaner. If you live in a big home, cleaning every corner of is not a big deal for the robotic vacuum cleaner. The quick action for dust and dirt results in healthy homes. The hygienic atmosphere does not require you to spend your holidays in cleaning and scratching dirt. You can sit back and relax while letting do all the cleaning task to the robotic vacuum cleaner. Surface detection feature of the robotic volume is highly appreciable. It can adjust automatically for different kinds of surfaces and initiate the cleaning accordingly. The artificial intelligence features clearly detect between stairs from walls and uneven surfaces. 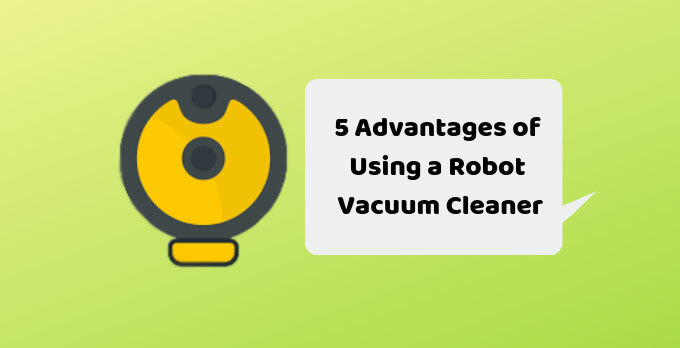 Once the cleaning task has been started, the very efficient robotic vacuum cleaner shall plug itself and get recharged for initiating cleaning task once again. It comes with a docking station which helps to charge it up the moment battery is low. With negligible maintenance and cost, you can clean every bit of the dirt in your home. If you treat the robot well, it can have a lifespan of several years. The great flexibility and features do not require any special maintenance or time investment. You can get your floor Shiny clean forever. Even the walls are going to be Shiny as the new robotic vacuum cleaner can detect it all at once. Even when you are several kilometers away from your home, you can simply allow some work to the highly magnanimous vacuum cleaner to ensure that everything is clean exactly the way it should be. The Machine repeatedly cleans the surface until and unless the dirt is removed. It immediately detects the number of efforts required for clearing away the dirt and acts accordingly. You can set up virtual walls for the robotic cleaner and initiate high-quality cleaning even outside the home premises. The vacuum robot cleaner comes with a large dust bag which collects dust from multiple cleaning sessions. It has the ability to switch between different modes of cleaning carpets and their floor. The advanced sensors immediately identify the variety of cleaning requirements. As you choose higher models, there are vacuum cleaners having better cleaning abilities and functions. Robotic vacuum cleaners are perfect for people having disabilities and mobility issues. With negligible efforts, you can get your home shining like new always.